Buzzing to get another win today!! Delighted for @JordanG_14 getting his first Wolves goal! Big thanks to the @OfficialWolves support!! KJ: "Grant Holt's loan is up this week and I have told him that we won't be extending it. We thank him for efforts during his time with us." KJ: "It was a very good, professional performance. Defensively we were very solid, I don't think they had a clear-cut chance." Much improved second half performance from Wolves. Great win. Onto Brighton!! Thanks everyone for your support wherever you are!! Thanks Otto for all your great work! Thanks for the comms lads. Hoping for a point on NYD (3 would be better). Another clean sheet. Great victory. Well done Kenny & the team. Thanks for great blog Larry & Otto. Great result. thanks again for blog. happy new year- into the playoffs by the end of season!! Radio W.M said we have been much better than of later in 2nd half - Is that true? Great result Happy New Year guys,thanks for the blog. Brighton goal-shy lately - maybe more points to come? 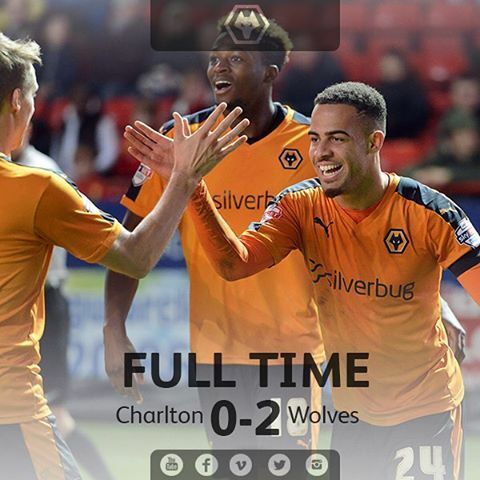 Full-time - Wolves overcome Charlton by two goals to nil. Will open my last bottle of OLD GOLDen hen tonight! Thanks for comments Otto and Larry sorry wasn't awake for most of them! Walsall top. Bostin end to the year. Thanks LOtto and a happy 2016 to you all. Thank you Otto and Larry, superb as always. and a very Happy New Year to all! Just in the mood to "rock" at Brighton!! HAPPY NEW YEAR TO ALL ON THE LIST- ONWARDS AND UPWARDS WE HOPE WITH OUR NEW SIGNINGS !! Happy New Year Bloggers! 2016 and upwards! Otto and Larry.....................thank you for this afternoon.................wishing you All Good Things for 2016.